This Giant Keyboard, the largest in the World, is a piece of modern art by Anatoly Vyatkin. Located on the banks of River Iset in Yekaterinburg (aka Ekaterinburg) Russia's fifth largest city. 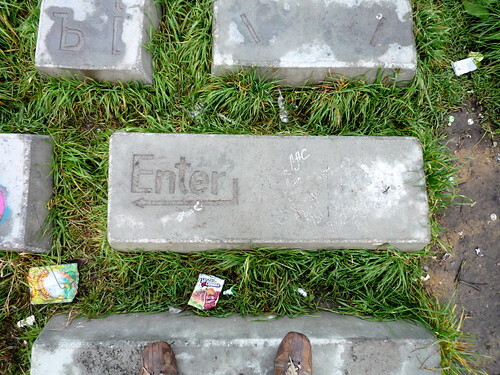 The keyboard has English and Cyrillic engraved on it and is known as Computer Keyboard Monument. 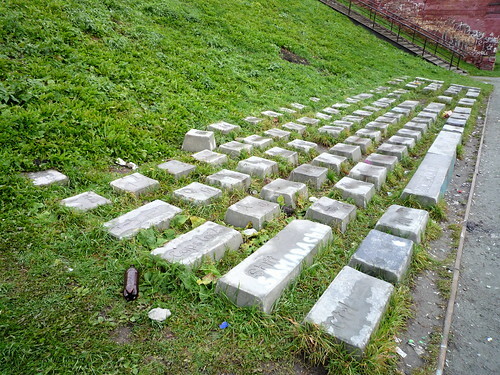 Each key of keypad is made of concrete and is an improvised bench which from a distance looks like randomly scattered stones, but a closer look reveals its true identity. The keys are placed in the same manner as in the standard (qwerty) keyboard measuring 16 metres x 4 metres and consists of 86 keys, made of concrete, weighing about 80 kg each. Credits: Special thanks to Redunzl. His post in Google Earth Community brought this to my knowledge.